Kudos to hubby and happy birthday to you. What a magnificent piece of art! 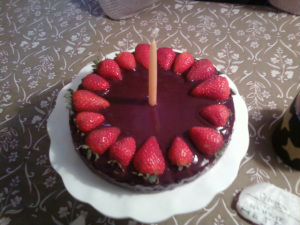 It looks as professional as the work of a French patissier, and I love the single candle; good move on the DH’s part! Your blog is wonderful, your house inspires admiration and a dose of envy I am fighting!